What’s the Best Tool to Use for Spade Bits? Powerful cordless or corded drills are ideal for spade bits – Bosch Daredevil spade bits are aggressive, and best matched with a powerful drill. We recommend using the Bosch 18V Brute Tough™ 1/2″ Hammer Drill/Driver. 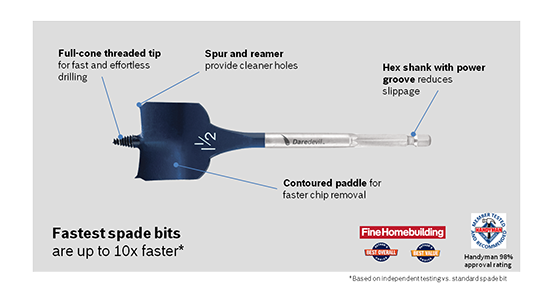 The most common sizes are ¾“ and 1“ diameter, however the Bosch Daredevil spade bits are available in ¼“ through 1-1/2“ diameters. Bosch Daredevil spade bits are available in an extended length for hard to reach applications and deeper hole drilling, a stubby (or short) length for tough to reach applications and shallow holes. Or you can simply buy an extension as an add-on to your standard spade bit length. Common Material to Drill with Spade Bits. After the bit engages the wood, you don’t need to push – just pull the trigger and let the drill do the work. Great for overhead drilling.